The Pellevé wrinkle reduction system is a safe, highly effective radio frequency skin tightening treatment that helps to reduce the appearance of wrinkles. Discomfort is minimal, no anaesthesia is required and there is no downtime. Pellevé is a great solution for facial rejuvenation without surgery. It is ideal for the difficult to treat delicate eye areas and those hard to treat lipstick lines on the top lip. The jowls and neck are also highly responsive to treatment. The result is an improvement in skin quality and firmness you can see and feel. 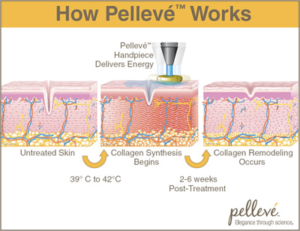 Unlike other skin tightening systems, Pellevé doesn’t require anaesthesia or skin cooling. Because the skin is not numb, you can describe the depth of feeling to our dermal therapist, which helps provide the best result in the area being treated. The overall result is a noticeable improvement in skin quality and appearance with minimal side effects and recovery time. The Pellevé System offers a different type of experience; a pleasant and more natural one, with results you can feel good about. There are many changes that come with aging, but one of the most feared is wrinkling skin. Fortunately, today there are wonderful treatments such as Pelleve radiofrequency available for those who wish to improve the appearance of ageing skin. Pellevé uses new and advanced radiowave technology to heat the deepest layers of skin, stimulating the production of new collagen in the face, without causing any of the skin damage associated with laser treatments. The treatment is usually comfortable and no anaesthesia needed. Each time this Pellevé hand piece is activated, a warming sensation will be felt. Once heated, the collagen in the deepest skin layer initially contracts then inflammatory cells migrate into the area, stimulating new collagen production in the weeks following the treatment. The entire rejuvenation treatment takes between 30 and 45 minutes. ON WHAT PART OF THE BODY IS PELLEVÉ USED? WHO WILL BENEFIT FROM PELLEVÉ? Candidates for Pellevé are healthy women and men, usually middle aged and older. Most Pellevé candidates have fine lines on the face, or wrinkled or drooping skin. Pellevé is most appropriate for those with mild to moderate wrinkling. WHAT ARE THE RESULTS OF THE PROCEDURE? The results of the Pellevé procedure vary according to the patient’s skin and ability to produce new collagen fibers. Patients who have healthier skin tend to experience more dramatic results. Over the weeks following the treatment, the patient’s skin gradually improves. The gradual improvements are a result of the skin tissues producing new collagen.Skin tightens and rejuvenates creating a more youthful look.